Young Poet, Kareem Parkins-Brown’s advice to arts organisations wanting to work with young people. Kareem Parkins-Brown set the tone for ‘Creative Margins: Clash of Culture’ with an in gallery performance of his poetry reflecting his own feelings of cultural clashes. 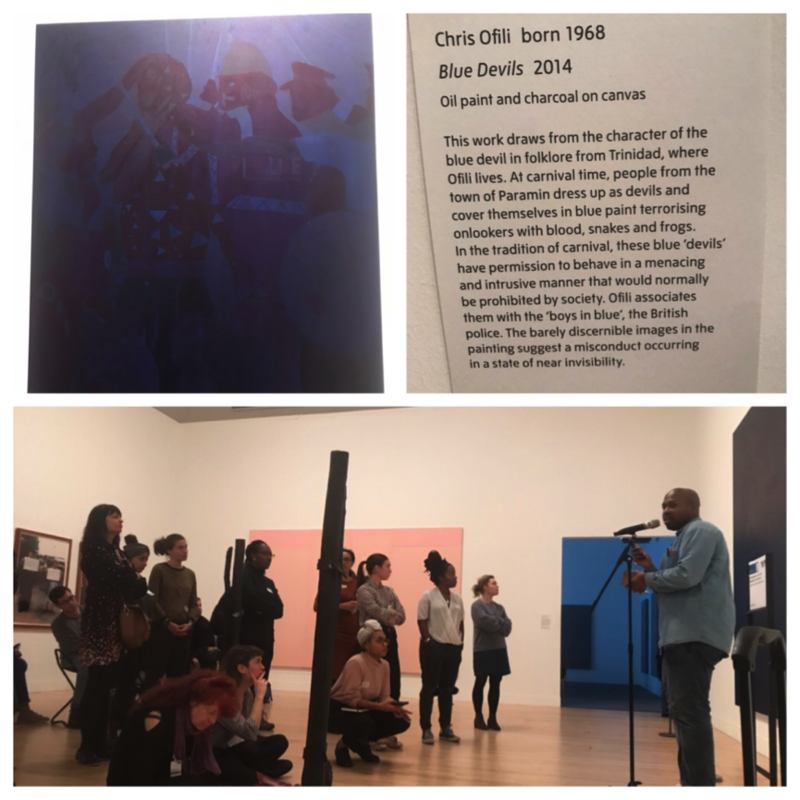 His two poems charismatically described his local area as one of ‘regeneration’ as a response to Chris Ofili’s work Blue Devils, in itself a work of art that capture tensions between old and new presences depicting the flurry of the Trinidad Festival with intrusive police presence. Kareem’s poems evoked the replacement of old with new. The replacement of the old basketball courts, the chicken shop, the pond with swans in favour of new trendy cafes and bars, symbolic of a place that now ‘takes itself too seriously’. The arrival of new crowds as the ‘ticket inspectors of cool’. His satirical characterisations of ‘Supreme Steve’ and ‘Flasha Tasha’ are relatable new social types attempting to infiltrate his space. These feeling of unusual presence, unease and difference often occur when the arts world comes together with the youth sector – the theme that this event sought to explore. In her introduction, Gabrielle Ivinson, argued that the arts are being asked to pick up work traditionally done by Youth Services. However this is with groups of young people that have no prior knowledge or proper sense of belonging within the arts institutions. The Creative Margins network has been designed to bring a range of different people, organisations and voices together to begin to think differently. With each of the events thus far being hosted in different setting: Youth Clubs, arts centres and theatre spaces, the diverse range of attendees have brought with them different knowledges, experiences, worries and stories. Key question: Where does your personal politics stop and start in your work? Mark reflected on some of the learning from the Circuit programme. Circuit was Paul Hamlyn funded programme which aimed to explore different models of ‘partnership’ between youth and arts organisations. It was designed to challenge the traditional ‘outreach’ model, starting with a core relationship between partners from the youth and arts sector. Key findings from this programme included a lack of understanding of youth work practice, a lack of knowledge about what happens in the gallery space as well as little acknowledgement of the wide and valuable background of young people. Mark questioned the notion of co-production and asked what constitutes a ‘true’ partnership. His final consideration was around the need for both arts and youth workers to review their own professional motivations for equality and social justice, asking where does personal politics stop and start in your work? Key question: What are the practical solutions to sustaining youth/arts partnerships? Nicky reported on finding from her PhD research which sought to explore the different models of partnership work within the Circuit programme. She reflected on a range of differences between the fields of the arts and youth work which were based around the educational, economic and social differences between the workers. This resulted in differing languages, experiences, traditions of practice and ways of being, which were hidden and often unacknowledged manifestations of power. She argued that youth work and the arts could be natural allies if the youth sector were able to better understand the gallery space and the arts sector could better engage with youth work practice. She addressed the need to develop a ‘culture of collaboration’ which could include research and practice networks, CPD, training of arts and youth workers within higher education settings and cross sector roles. These would assist in developing people who can respond to the needs and talk the language of both fields. Key question: How can we involve artists is framing equitable partnerships? As a sound artist, gallery educator and youth worker, Hannah gave details on the ‘many hats she wears’. She offered her perspective on her different frames of reference and how the two worlds can meet. She referred to “transferring the chaos” of youth work and youth projects often to the feet of the artists, who been have been positioned as a bandaid – bridging the void between the youth club and the arts museum. She encouraged participants to explore their hybrid positions and embrace the interdisciplinary. Hannah described the benefits of engaging artists in partnership work which focuses on process rather than product, ideas rather than medium and quality of experience rather than assessing impact. In response to these provocations, network members raised that there exists a ‘hiddeness about peoples lives’ and many missed opportunities for harnessing the skills of workers in alternative spaces. A cultural shift in organisations was called for in the way that workers can be ‘trusted’ to work differently. We may choose to work for organisations where our values align, we might be lucky enough to be employed by them – but it was recognised that this is not a universal experience. Funding was also actively discussed in relation to the structural change of partnership work. There were several comments about the different agendas that funding brings and the importance of experimenting without funding. Often the best artistic work is created without funding, without focus and without an end product. The importance of ‘lived’ experience in facilitation and programming was also raised. Lived experience in relation to employing artists from the local area, acknowledgment of young people’s cultural funds of knowledge and the lived experiences they bring with them. In this way, we are recognising the power of young people as a group – their collective power, as a way of recognising difference. Breakout sessions from a range of organisations working with young people and the arts followed the discussion and provocations. The first session with Anna Glarin and Emily Reddon from London Youth shared their learning around the Young Culture Makers programme. This programme supported community youth organisations to run arts activities. Their session explored how to ensure that youth workers have a positive experience within arts programmes and how youth centres worked to ‘scaffold trust’ with diverse groups of young people, but also to widen out the range of partners they are working with. Breakout session 2 with Carol Pierre, an independent researcher and social historian, explored the question of bridging the gap between working class young people and the gallery. The participants in this session explored how gallery programming could be more inclusive for working class young people and arrived at some practical suggestions including removing non-paid internships and supporting young freelance programming. The third breakout session was run by Salma Istwani and Ekram from Refugee Youth. 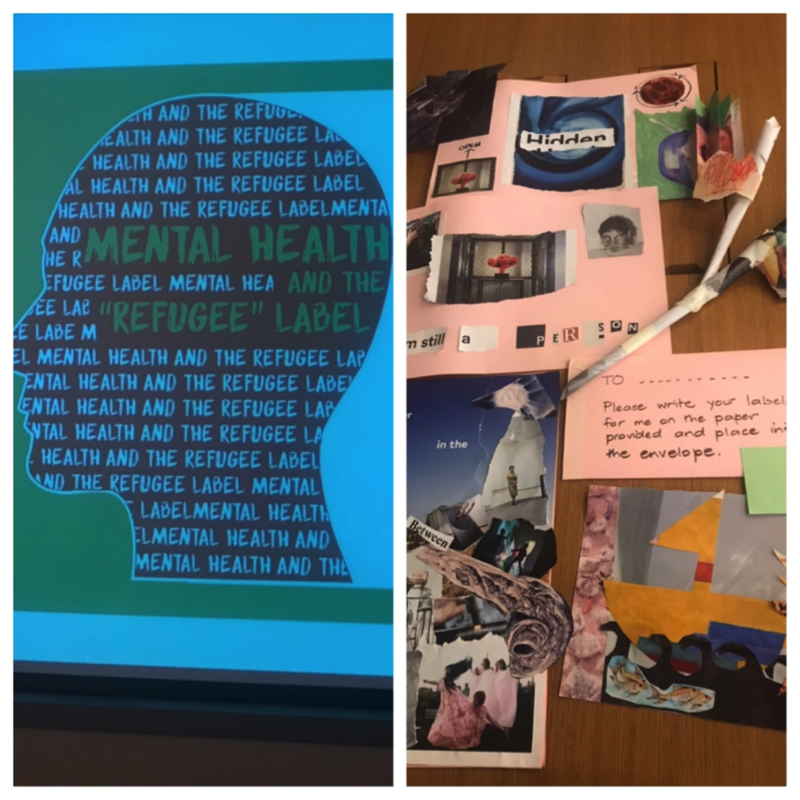 This session employed youth work methods and creative arts activities in order to explore the labelling “refugee” young people in relation to their mental health. This approach encouraged participants to think differently by thinking through the use of creative tools and alternative means of communication. Pat Thomson reflected on two key themes that had re-occurred throughout the day: funding and the portrayal of institutions. She argued that we were not perhaps exploring a “Clash of Cultures” but the effects of “living within” organisations. As things that lie within other things, the economies that sit within capitalism. She cited the notion of “subjugated economies” from Gibson-Graham (2001) in relation to the ways that particular functions within society are hidden, they are happening alongside. This reflected, she argued, the sometimes troubled relationships between youth work and arts organisations. She recognised that there are similar principals of community development held by both socially-engaged arts practice and detached youth work and that by exploring ‘alternative economies’ differing models might emerge which would make partnerships more sustainable. These models would be based around redistributing the wealth among the population and sharing resources, rather than expecting more from government funding. In the discussion that followed there were key messages from the day which included the shared vision, practices and values of youth work and the arts, the need for more room for critical discussion, questioning what we take for granted and the relinquishing of power to young people. There is need to more recognition around hidden knowledge and creativity within both in institutions communities and youth centres. The group recognised the need to check our own privilege, our own assumptions and the importance of sharing information across networks. The need for places and spaces where practitioners from youth work and the arts can talk through networks such as Creative Margins and further events. The importance of exploring alternative funding and economic models to end short-termism and the competition for government funding. The need for organisational change which could include the re-allocation of existing budgets towards youth work and the arts. The importance of an ongoing conversation about how arts organisations can be inclusive in their decision-making practices and forefront youth voice and a youth-led perspective. A manifesto was suggested which could explore the shared agendas of youth work and the arts, but also highlight the local issues that are most important to young people. In sum, instead of considering youth work and the arts as a ‘Clash of Cultures’, they can be seen as subjugated, symbiotic and sometimes hidden resources for society.